With the growing trend of adopting digital technologies in every industry, the competition among the rivalries has grown to an unimaginable extent and it continues to throw new challenges for businesses everyday as the players continue to innovate and improvise in the race to stay ahead. 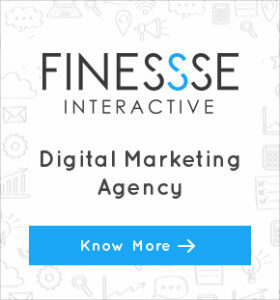 The advancement in technologies and its marketing science have armed businesses with a humongous pallet of digital platforms and tools for creating value and bring delight to its customers. With digital innovation happening at rapid pace, CEOs of businesses have to understand and be aware of the role digital plays in their respective industries and how much it impacts growth and success in the market. Moreover, it’s time for the CEOs to be present digitally and hear the people out. For today’s CEOs, engaging on social media helps them understand the needs of their customers up-close and explore what the competitors are doing on the digital platform. Gradually the scenario is changing but if you’re a CEO who thinks your engagement would be nothing but a waste of time, we’ve 15 quick facts and stats to encourage you to change the way you think. Have a look at these pointers and rest assured you are going to revise your strategies. To start with, according to a research done by CEO.com, 60% of Fortune 500 CEOs prefer to stay behind the doors and lead from there! Moreover, in Asia only 47% of CEOs have a social media presence and less than 10% of CEOs are active on it. It’s time to up your game in social media. Having said that, there are many global CEOs who are extensively using social media for their businesses and engaging with its followers. To name a few, Bill Gates, Tim Cook , Elon Musk and Anand Mahindra are some CEOs who leverage social media to achieve brand loyalty and to build a following. Every CEO/Business has a preferred social media platform that gives them good reach and helps them understand what the customers are looking for. 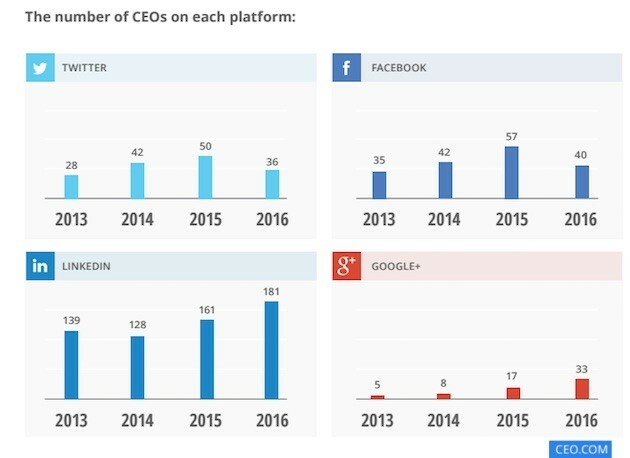 According to CEO.com (refer stats below), LinkedIn is the most preferred followed by Facebook and Twitter. The story of an Indian CEO joining social media is a gem. Jessie Paul , former CMO of Wipro and the current CEO of Paul Writer makes her a charm at Twitter and LinkedIn. She was one of the LinkedIn’s first users in India in the early 2000s and the way she created a network of CMOs in her earlier days is best trade practice. For her, social media is more than making friends or killing time. It is a platform where some serious knowledge sharing is going on and an ocean where many business opportunities are waiting to be explored. While we are talking about the involvement of CEOs on social media, it is not wrong to say that employees are curious to see what their CEOs are saying and sharing on social media. According to Hootsuite’s report, 73% of employees do search to see what their CEOs are saying on social media and it is because the corporate reputation and business performance is majorly dependent on Social Media. The more the engagement, more the effective leader. This is what employees have to say about their CEOs. 73% of employees think that social media engagement makes CEOs more effective leaders because they know the real scenario and helps them to take decisions better. 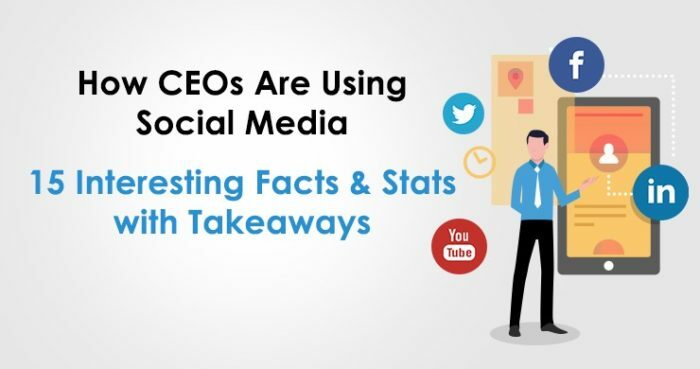 Among the group of CEOs who use social media to stay updated about the latest trends and techniques, there are some CEOs who are becoming influencers in their industry by showing their real side on social media to and know their customers inside out. One such example is the CEO of T-mobile John Legere. His personal account on Twitter has 5.27M followers whereas, his biggest competitors Verzion’s verified account has 1.66M followers. He tweets about his interests, his business and shares a lot of stuff that is happening around the world. Many Indian CEOs have also taken the social media lead to engage with its customers, followers and observe the trends and have a voice for themselves. To top the list of Indian CEOs active on social media, it is none other than the CEO of Mahindra & Mahindra- Anand Mahindra. With 6.74M followers on twitter he is one of the top 10 global CEOs who have such huge followers and one must follow him as he has the most eye catching hashtags which makes him so unique and wanted in everyone’s list. Engagement has been and will always be the key. Are you aware that 77% of Twitter users are more positive towards the brand when they have an interaction with on social media? Moreover, 82% of customers have already ended their relationship with a company because of the poor customer service. The two way conversation is a must to increase your loyal customers. As a CEO, being actively present on social media also helps you to keep a tab on how your company handles customer service on social media. If these statistics are to be believed, 67% of consumers use social media platforms like Twitter and Facebook to seek resolutions for their concerns or issues and nearly 70% of consumers have at least once used social media to get their compliant resolved. An upset customer of T-mobile once sent a tweet and John Legere addressed it publicly and resolved the issue on the social media platform in front of his millions of followers. One of the major reasons why CEOs are and should be active on social media is to find growth in new market channels. In a survey done by Forbes Insight on 573 global business leaders, it is clearly been seen that 46% of executives cite this very reason to be present on social media. As they say, first impression is the last impression; such is the situation for a customer using your services for the first time. More than 80% of the first time users or employees who are willing to apply for jobs in your organization will first search you on social media and see what you engage in and how much is the organization active on the social media platform. A lot of consumers get influenced by the opinions and thoughts of influencers than ever before. 49% of consumers today would choose for products and services recommended by influencers when making purchasing decisions. Thus partnering with influencers can help you boost the brand awareness and build trust among your targeted audience. Being a CEO, you are at a better position than your employees to connect and engage with influencers. With the pace at which digital landscape is changing and improvising, CEOs now no longer have luxury to take social media asan option but it has become a necessity. 90% of global businesses have already initiated a formal digital transformation strategic planning for better reach and engagement with their targeted audience.